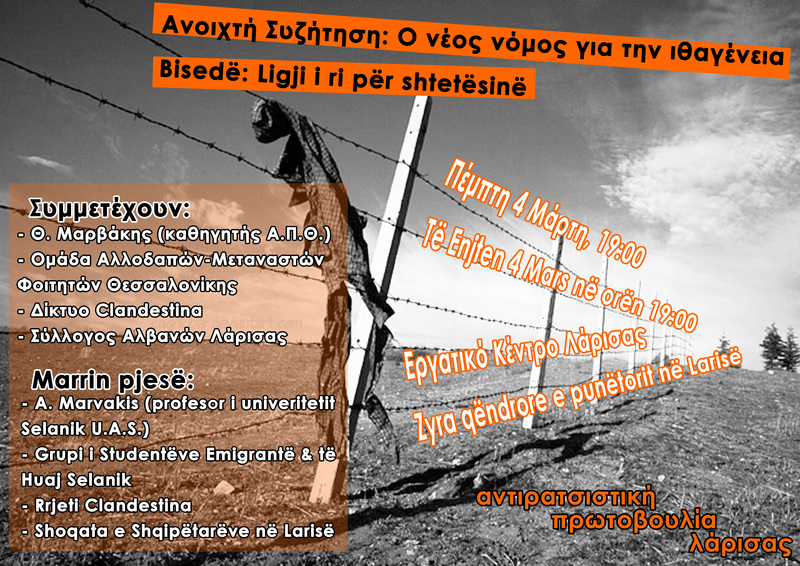 Chania, Friday 5 March, 8 pm, Technical Chamber Chania, Nearhou str. Fasco-thugs hit once more in Chania, Crete. The fasco-thugs in Chania, Crete made one more hideus, cowardice assault (for the previous ones see this and this). In the small hours of Dec 27 inside a bar in the city’s Venetian Port area (an area with many bars) they beat with baseball bats and knuckle dusters two Palestinians and one Moroccan guy, as well as a German woman who was in their company. They only person in that company they did not beat was a Greek woman. The “hit squad” of the thugs entered the bar prepared and with the sole purpose of attempting the murderous assault they did attempt, without having been provoked in no way whatsoever. The male immigrants suffered injuries at their head and face, but were not in immediate need of hospitalisation after receiving first aid treatment. The German woman is at hospital, with very severe injuries at her head and with face virtually deformed. 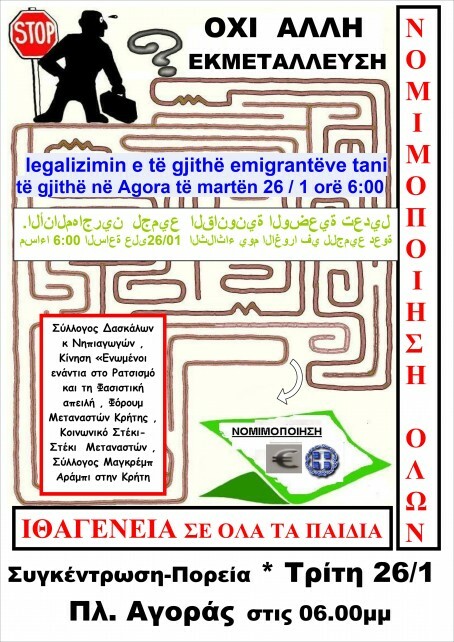 source: Forum of Migrants in Crete’s blog. 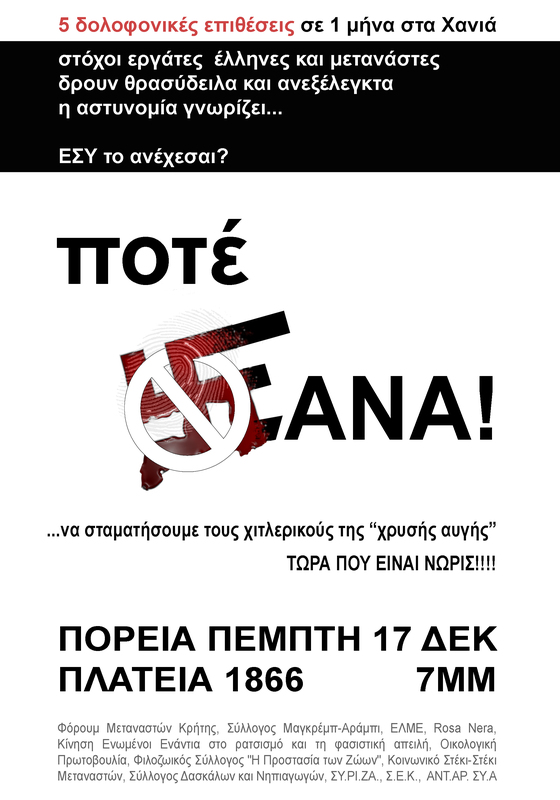 New assaults by para-state neo-nazis in Chania Crete against social spaces and comrade’s home – Rally and march tomorrow against rising fascist violence. Immigrant's Haunt, Social Haunt's entrance after the fire. Police’s pets, right extremists in Chania, Crete, continue with their aggression. Yesterday evening, unknown perpetrators threw two molotov coctail bombs against the family house of a comrade who is involved in anarchist and antiracist initiatives, while his family (not he himself) was inside (includng his toddler nephew). Some days ago, he and a friend had been ambushed late at night by a group of ten and severely beaten. Info by Chaniotika Nea local newpaper. The last social space hit by the fasco-group(s) in the town of Chania was the Immigrants Haunt – Social Haunt. 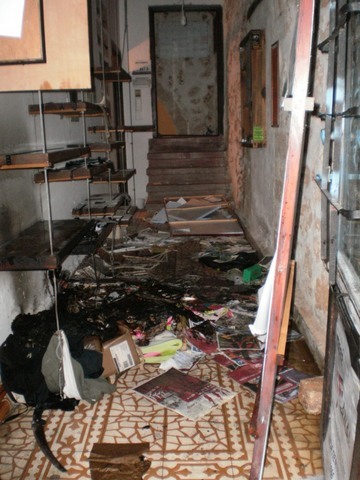 In the small hours yesterday night they broke into the building and put a fire on the entrance. They signed on the walls with swastikas. Last week they had painted racist graffiti on the outside walls. AFTER THE RECENT NEO-NAZI-ACTIVITY, AN ANTI-FASCIST RALLY AND MARCH CALL HAS BEEN MADE BY VARIOUS ORGANISATIONS AND COLLECTIVES FOR TOMORROW, THURSDAY, DEC 17, 19.00, AT AGORA SQ. BELOW IS THE POSTER CALLING. Murderous assaults by neo-nazis in Chania, Crete, and impunity for racist murder perpetrators. Τwo immigrants were savagely assaulted by last Tuesday, December 8, in downtown Chania, at10 at night. The unknown perpetrators nearly killed the immigrants who were sitting on a bench in a square of the city centre. They attacked them with iron crowbars, all of a sudden and from the back, and behind the bench so that not to be noticed and resisted by their victims . They left them with serious head and body injuries. One of the 2 immigrant workers happened to be one of the 15 hunger strikers who last year surprised the town with their proud struggle. At the hospital he was able to give us a first description of the thugs. Gym freaks with shaved heads. Figures that allow us to suspect with certainty the neo-Nazis, Hitler-nostalgics, para-state that recently have been trying to make their pittiful presence sensed in the town. The scumbags who in large groups ambush and beat individuals simply because they do not like their face of social and political areas because they classify them as enemies of the homeland and their Aryan race. The same people who appear and “provoke” rallies and marches, who flock and flirt in public with the police, who threaten or beat protesters, because they don’t like demonstrations. They have long been active in our town as well, and elsewhere in the prefectire, as in Kastelli Kissamou. The names of their leaders have been whispered in schools, football stadiums and cafes. They recruit and trade in the divisive violence among the the youth whose blood is hot with passion and anger. They complete the work begun by “loyal to democracy” right-wing circles and political spaces. They poison the social body with hatred and preposterous lies for ten years now, with the full support of economic and political power blocs. The neo-Nazis are merely the executive arm of the fascist turn in the society . After the uprising of December, these processes accelerated. Like everywhere in Greece, so in the ‘democratic Chania’ we have been witnessing a proliferation of attacks against immigrants and struggling people. In fact, the perpetrators have been acting scandalously undisturbed. We have no doubt that the society of labor, work, dignity, the democratic society can deal with them. It must stand against to them, because it is itself the target of fascists. This is what fascists hate and want to discipline, just like their ideological ancestors 70 years ago did. Innocent by-standers of an assassination!!! At New Year’s Day 2006, a young Albanian was killed with incredible ferocity -17 stabs – in his house, in Old Town, Rethymno. His fault was that he was Albanian. His name was Edison Jahai. Is society to be trained to tolerate injustice? Is society to be trained not to claim its rights – social, economic, political, labor – and be satisfied with what is minimum and be in fear of losing even this? We think this Court of Appeals’ decision took this direction. It is unfair and humiliating for both dead Edison and his family. It is dangerous at a time when atrocities against wage-workers by trained Nazi stabbers prolifarate. The response to all forms of injustice and all forms of rights violations, all racist murderous attack must be the strengthening of the fight for a society with equality and freedom, with essential respect to life and dignity. For racism does not only affect its victrims, but also those who tolerate it.